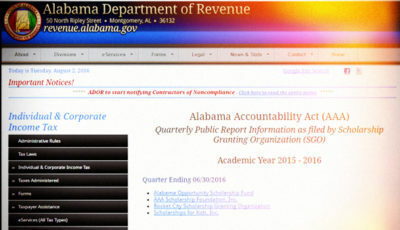 The Alabama Accountability Act (AAA) has three parts: the Flexibility portion, the Tax Credit/Transfer portion, and the Educational Scholarship Grant Organization/Scholarship portion. Please read Part 1 about the Flexibility portion. 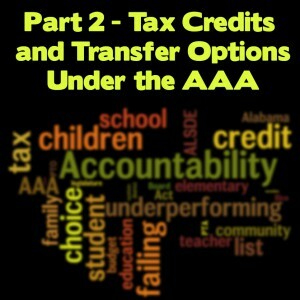 This post will dissect the Tax Credit and Choice to Transfer portion. Know that some rules and regulations have yet to be determined and created by the State Department of Education (ALSDE) and the Alabama Department of Revenue (ADOR). One big question to be determined is whether the tax credit applies to families of children who are zoned to attend a “failing” school and already attend a private school or if the credit only applies to children who transfer to a private school for the first time during the 2013-2014 school year. We just don’t know that answer yet. UPDATE: June 24: ADOR stated that parents of children who are already enrolled in private schools are not eligible for tax credits. Here’s the al.com story. This post is written from the perspective of understanding the usefulness of the AAA and how parents and families can actually utilize the law if they choose to remove their child from a “failing” school. 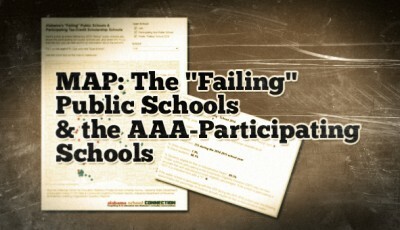 It is not an endorsement of the AAA nor an endorsement of private over public schools. It is my attempt to present the information to families who may be affected by the law and are not aware of the details of the law. The other big question is what does The List look like? 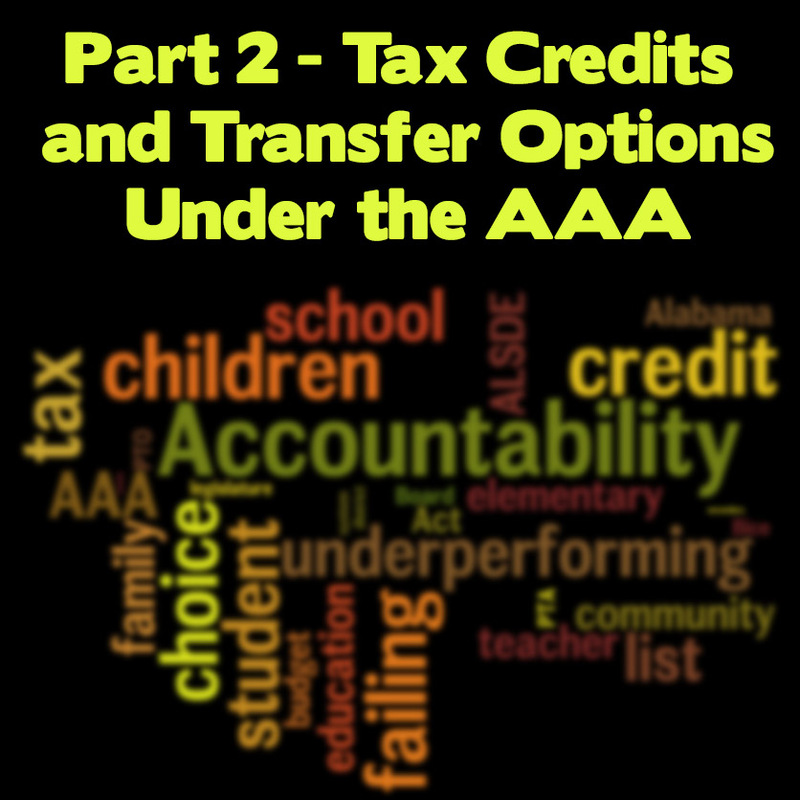 It is fair to say that the usefulness of the Tax Credit/Transfer portion of the AAA for families depends on which schools end up on The List. The List will name the schools the AAA terms as “failing”, a label that I abhor and that State Superintendent Dr. Tommy Bice has indicated his distaste for as well. The List will be produced by June 13, according to Bice. UPDATE: June 18: The List was released. Click here for full information from the ALSDE. The language in (i) and (ii) clearly place the responsibility for determining the metrics/measurements that place a school within those parameters with the ALSDE until the legislative grading system is utilized in 2017. While two State Board of Education (SBOE) members, Mary Scott Hunter and Charles Elliott have acknowledged that the SBOE and ALSDE have the sole ability to determine who ends up on the “failing” list, Bice has made it clear that he will not purposely circumvent or otherwise evade the law’s intent by setting parameters to minimize the number of schools on The List. Section (iii) applies to the development of the legislative grading system of schools that should be ready for full use by June 1, 2017…..four years from now. HB588 became law in 2012 and gives full responsibility for creating the grading system to the ALSDE. I am highly concerned that the first mandated deadline for creating the grading system was missed by Bice and yet no one has pushed for a reason why. Section 2(c) in HB588 states: “The State Superintendent of Education shall prescribe the design and content of the school grading system by not later than December 31, 2012.” That’s pretty clear. No doubt the determination is complicated, due in large part to Plan 2020’s new assessments and the need to establish proper baseline assessment scores and set benchmarks. It still would be nice to have an explanation from Bice as to what the hold up is. In sum total, then, it is the sole responsibility of the ALSDE and the SBOE to determine which schools meet the definition of “failing”. No need to continue speculating at this point as to which schools will be on The List. We will know soon enough. How Will You Know If Your Child Is Zoned to Attend a “Failing School”? No doubt The List will be shown far and wide in the media. But if a family somehow misses it in the headlines of their local paper, the AAA requires the “failing” school to “timely notify” all children who are “assigned” to attend the school that the school has been designated as “failing” and what the child’s and family’s options are. So what are your options if your school ends up on The List? If Your Child Is Zoned to Attend a “Failing” School: What Are Your Options for Where You Can Enroll Your Child? I’ve already written about what types of choices parents and families have available to them in Alabama. It boils down to public, private, homeschool, or magnet (if you live in one of the 12 districts that has one of the 39 magnet schools). If your child is zoned to attend a Title I school in “school improvement” by No Child Left Behind standards, you should be given the opportunity to transfer to a school within the same district to a school that is not in school improvement. Your child may even have the good fortune to be allowed to attend a public school that he is not zoned to attend (“out of district”). That is rare in Alabama, but it has been known to happen. Additionally, if a school district is lax about enforcing school zones, your child may have some choice provided to her. It never hurts to ask. Other than those choices, until now, the last remaining choice is to physically move your family into another district or school zone. And for most of us, these choices will remain as our only choices, even with the AAA. However, if your child is zoned (or “assigned” as the AAA puts it) to attend a “failing” school…one that has landed on The List described in the previous section…you have an additional choice, albeit it depends on a couple of other things falling into place. IMPORTANT: Know that the choice to attend a school other than the “failing” school to which your child is zoned only extends through the grade level that the “failing” school offers. For example, if your child is going into the 4th grade for the 2013-2014 school year, and the school to which your child is zoned is designated as “failing”, and the school is a K-5th grade school, the option to transfer, and stay, out of that school only extends through the end of the 5th grade year. If the school to which your child is zoned for the 6th grade is not designated as “failing”, the options available under AAA are no longer available to your child when he reaches the 6th grade. So be certain to think long-term about where your child may attend school and how many times your child may be forced to move from school to school and whether your child can well handle those moves. 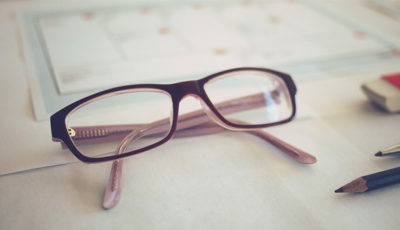 Sit down and write out a 4- or 5-year plan (or longer if you know where you are living will remain the same for a long period of time) for your child to figure out what the long-term options are. Bouncing from school to school has been proven to be detrimental to some children. You may find it better to stay within your “failing” school and work to make it better rather than transfer for a year or two and then come back into the system. These are personal choices that you need to carefully consider and think through before making a final decision to choose a new school for your child. No one knows your child better than you. First Choice: if you plan on remaining in the public school system, you must first ask your school district officials for a transfer to a non-failing public school within your district. If there is space, the district must accept your request for transfer AND must provide transportation (or negotiate reimbursing you somehow) for your child to attend that in-district school. If no space is available, or if none of the schools within your district are not labeled “failing”, go to the Second Choice. Second Choice: you can attempt to enroll your child in a non-failing public school in a different district. “Attempt” is the key word here. The AAA gives districts the option of not accepting students out of their district who are eligible to move out of a failing school within their own district. For example: if you are zoned to a failing school in District A, District B does not have to enroll your child. If District B does agree to enroll your child, transportation is completely up to you. If you cannot find a public school district to enroll your child, you have an option to seek a nonpublic, or private, school. I am not going to get into the details of how some state funding follows the student through the tax credit while some stays at the “failing” school if you choose to leave the “failing” school. Let’s stay focused on actually WHERE your child can get enrolled to attend school. Here is the most recent federally-generated list of private schools in Alabamawith some details about where they are, how many students they have and if they are religious-based or not. This data is from the National Center for Education Statistics Private School Universe survey from the 2009-2010 school year. It is in Excel format so you can sort and re-sort if you so choose. The list is currently sorted in alphabetical order by city. This list is NOT a current list. In fact, I see a couple of schools on there that I know are no longer in existence and know of others that are not on the list. UPDATE: June 24: ADOR released proposed rules regarding how nonpublic schools must qualify to participate, and only parents of students enrolled in qualifying nonpublic schools will be eligible to receive a tax credit. Here’s the form the nonpublic school must complete in order to participate. A complete list of approved nonpublic schools will be on ADOR’s web site on August 1. If you know that you plan to enroll your child in a non-public, a.k.a. private, school, you will incur the full cost of tuition, but should be eligible for a tax credit equal to 80% of the state-funded per-student amount for that school year if your nonpublic school has qualified under ADOR’s rules. For FY13 (which is fiscal year 2013, running from October 1, 2012, to September 30, 2013), that amount is $3537.67. The AAA prescribes the formula as the amount appropriated to the Foundation Program, which for FY13 was $3,277,022,657, divided by Average Daily Membership (ADM), or how many children were enrolled on average in the 20 days after Labor Day, which was 741,057.86 for FY13. That tax credit is awarded when you file the tax return the following year. So you pay it all up front. It is a refundable credit, which means that if your tax liability is less than the amount of the tax credit, the state will return the difference in your tax liability and the tuition tax credit to you. You may be able to take part in the Educational Scholarship portion of the AAA if your income does not exceed 150% of the median household income, which works out to about $64,000 according to al.com. So if your income is less than that, your child is considered an Eligible Student and you can apply for a scholarship offered by one of the Educational Scholarship Grant Organizations (SGOs) that is expected to form to support children who wish to move from “failing” schools but can’t afford to pay private school tuition. SGOs are nonprofits to whom donations become tax-deductible and will offer Scholarships to Eligible Students. Once your child is determined to be “Eligible” and actually receives a Scholarship from an SGO, he remains eligible until age 19 or he graduates high school, regardless of whether your income increases past the 150% level. There are a number of moving parts to this option, too, and that will be the subject of tomorrow’s post. If you can transfer your child to a “non-failing” public school within your district, transportation costs are the responsibility of the school district. If you can transfer your child to a “non-failing” public school outside of your district, transportation costs are your responsibility. And no school district can be forced to enroll your child. If you choose to send your child to a private school and can afford to pay the tuition, you can receive a tax credit for up to 80% of the state-funded amount for your child. If you choose to send your child to a private school and don’t have the money to pay full tuition at a private school and meet the income guidelines, you have the option of seeking a scholarship from an ESGO. Next up, the SGOs: what monies may be made available, how to access the Scholarships they offer, who can donate, and the rules under which SGOs must operate.